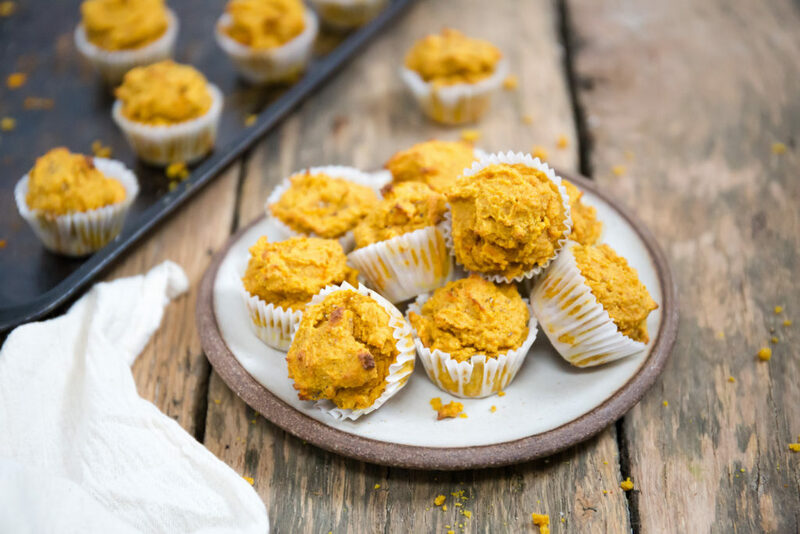 These sweet potato turmeric muffins have essences of orange and hints of gingery spice. 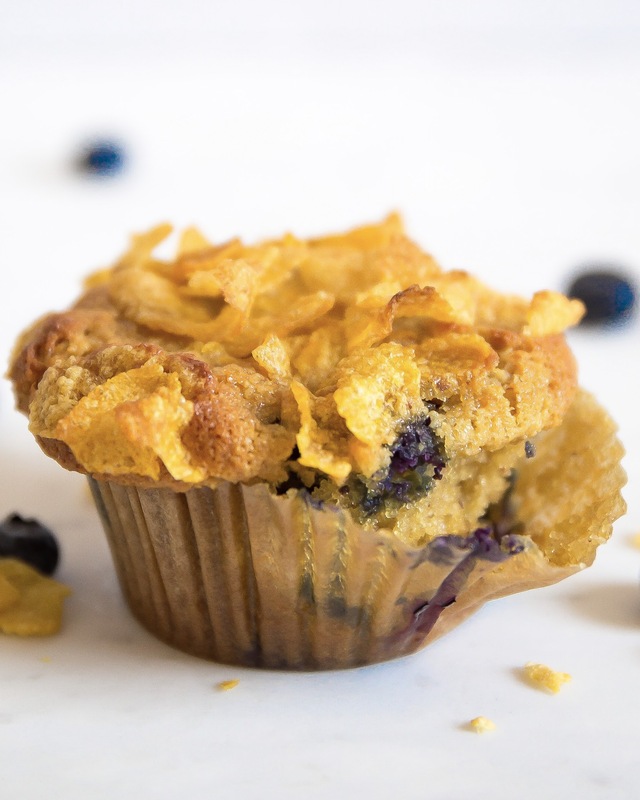 They’re absolutely filled with protein and anti-inflammatory compounds, and make a perfect breakfast or snack. The women’s march was this weekend. At first, I wasn’t sure I was going to go. While in every way I’m about supporting women and, perhaps more importantly, girls, I’m not a huge fan of crowds, which stoke my already-heightened anxiety (it never occurred to me to be afraid of crowds until I attended a Rolling Stones concert in Brazil, which was free and on Copacabana beach and attended by two million people. People who pressed up against you, their sweaty arms molding onto yours. People who climbed trees to get a better view until the trees cracked and fell upon the other people, the people who couldn’t go right or left or forward or back because of more and more and more people. People who were passed in stretchers overhead when they fainted or worse, because it was the only way to get through the other people. Needless to say, I’ve been wary since then). On Saturday morning, I lay in bed, watching my friends prep their signs and their pink hats. I felt tears come to my eyes as I partook as only a spectator, as I watched people I knew from around the world ready themselves to come together. And I knew I had to come too. I knew the march would inspire me (it did). I knew it would frighten me a little (it did that too, and that was okay – one of my new year’s goals is to become more comfortably sitting in my moments of fear). I didn’t know how much it would move me (although not literally – 500,000 people making their way through the streets of midtown New York is a slow-going process!). To see little girls in superhero costumes. To see little girls holding hand-lettered and drawn signs. To see little girls believing in themselves and their future because it is their birth right, and because millions and millions of men and women across the world were coming together on this day to affirm that. To me, the march wasn’t about political affiliations or protest (although I acknowledge for many that was the case). It was a place where we could come together in a year full of contention and agree upon one thing: that empowering women is never a bad idea. That every five, six, eight, ten year old should believe in the positivity of their personal future, and that of the planet. It gave me hope in a way I haven’t felt in a long time. And with that, let’s talk about muffins. 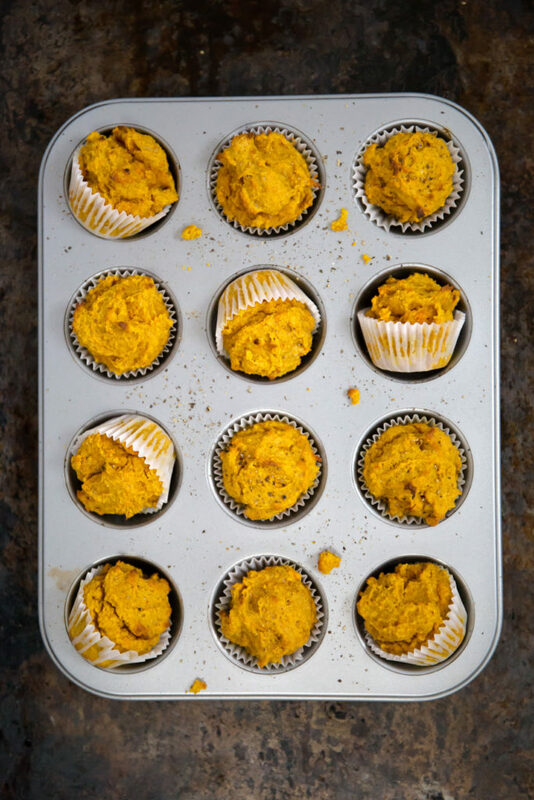 As a turmeric fan girl, I’ve long wanted to make a turmeric muffin that would capture the earthy qualities of the spice that I loved (not to mention the incredible anti-inflammatory health benefits – if you have allergies or are trying to duck around the office cold, a muffin a morning will keep them at bay). This muffin is absolutely perfect. 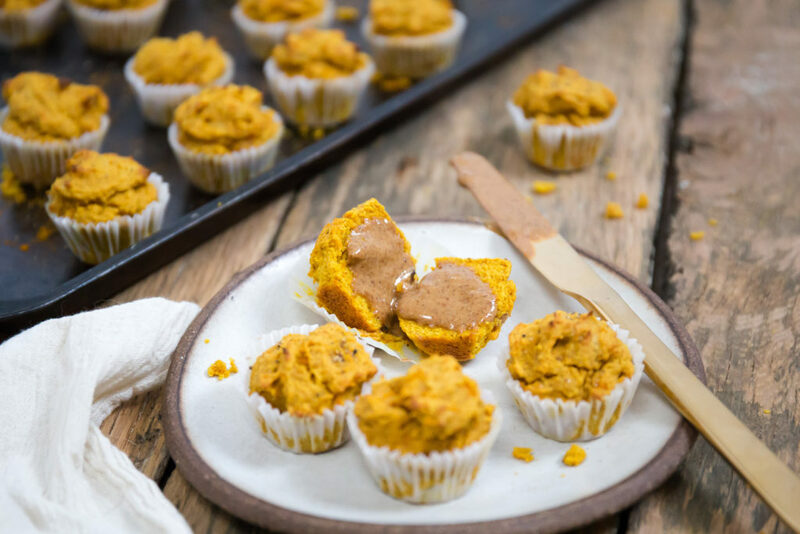 It’s basically an orange party – orange zest lends a gorgeous zesty sweetness, and sweet potato makes for a rich, caramel-y, fiber-full base. 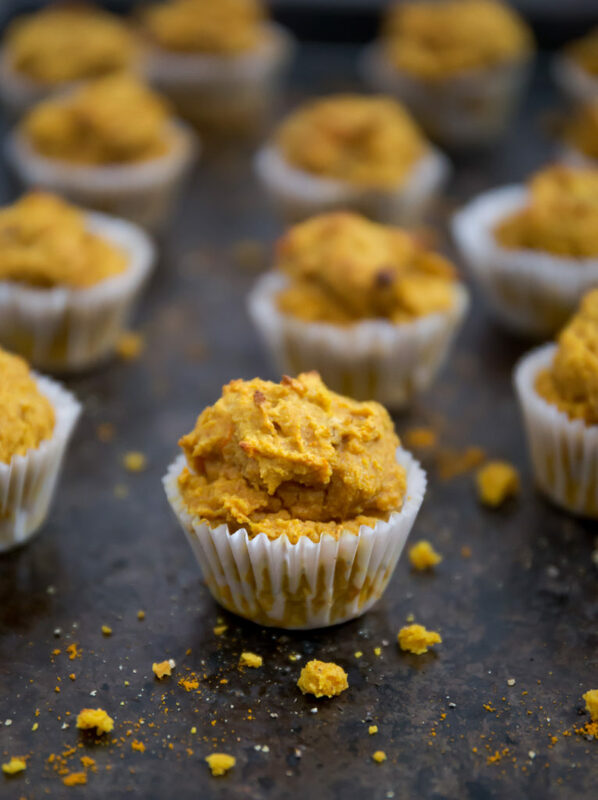 All of that orange color means these babies are absolutely loaded with Vitamin A, which makes your skin glow (among other things). 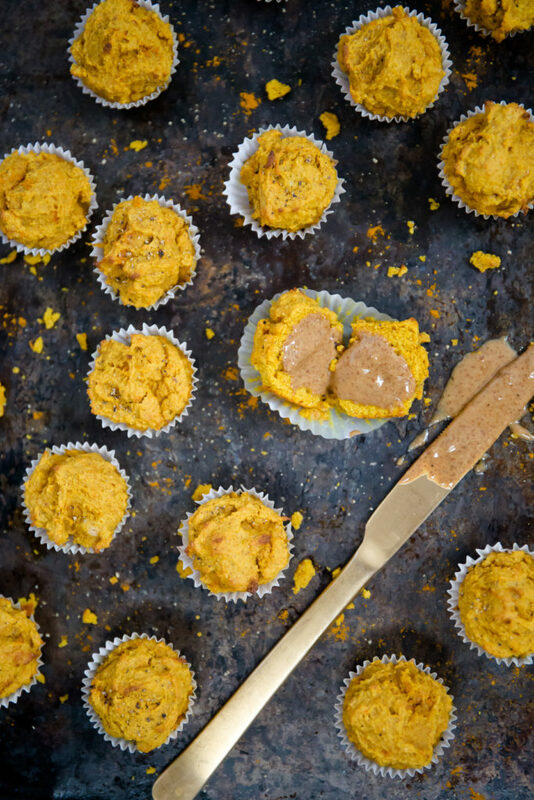 The pastured eggs, almond flour, nut butter and coconut flour take the place of tradition grains, while adding antiviral properties, even more fiber and tons – I mean, TONS – of protein. I love to eat these for breakfast toasted with a bit of almond butter, but the possibilities are really endless. Made these today. Very good indeed – even better with added chopped hazelnuts and/or sultanas. 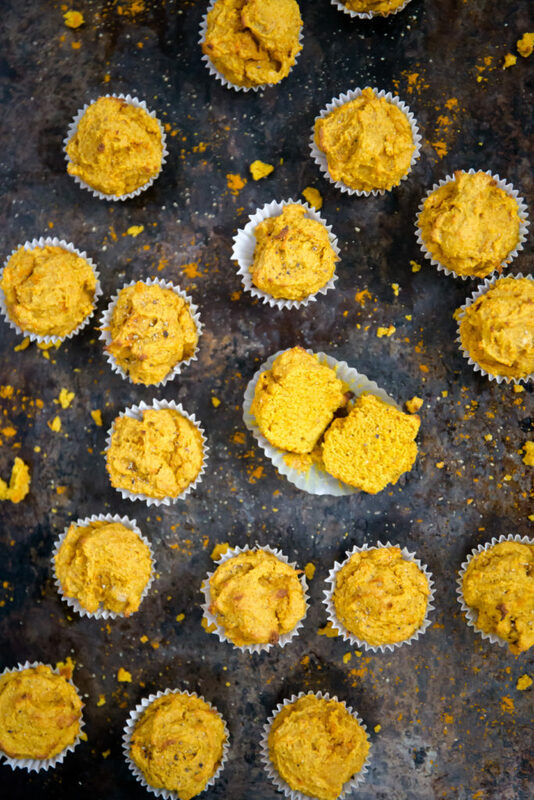 I only used 1 teaspoonful each of turmeric and ginger, although the recipe seems to call for tablespoons (!). Made these last night…..simply incredible! Definitely a new favorite. Thanks for your deliciously adventurous recipes! Thanks, Tessa! I’m glad you loved them! What do You mean by ginger, a ginger powder or truely fresh ginger chopped? Sorry this might be a dumb question! Ginger powder, and not dumb at all – I’ll update the recipe! Thanks for commenting, Karen! Glad you loved ’em – the butternut squash sounds great! I made this recipe just now with a couple of substitutions because of what I had in my pantry. Wonderful flavor and truly delightful to eat – good texture. I used the zest of one lemon instead of orange zest. I also substituted out the almond and coconut flowers for 2/3 c sifted GF oat bran. 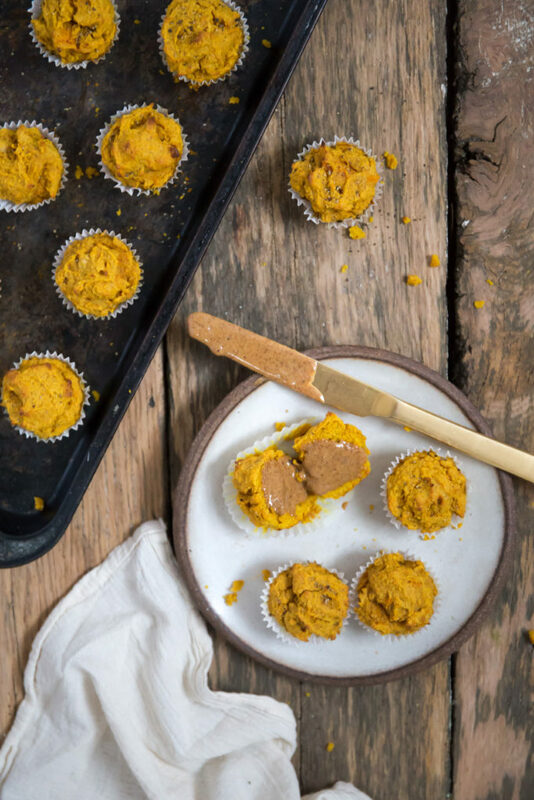 Rachel had wondered about a nut allergy – using the oat bran instead as well as using sunflower butter would be great alternatives making it nut free :). Thanks for the great recipe. 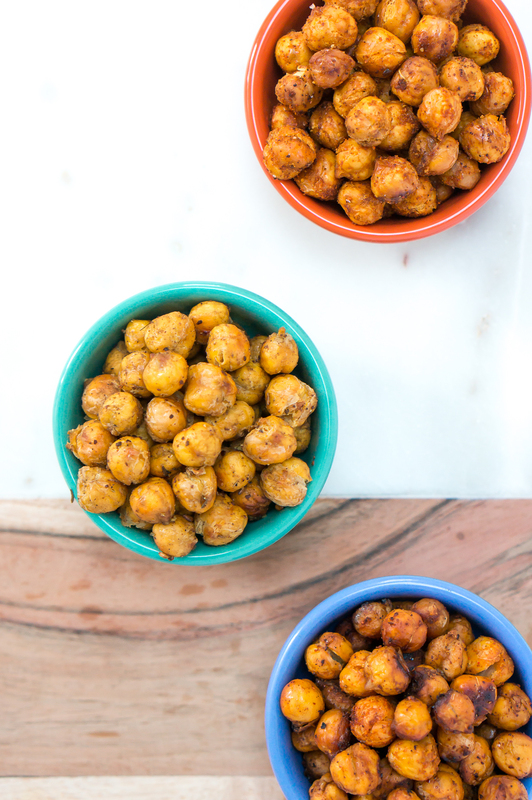 Reply to 7 Grab & Go Snacks That Will Heal Your Gut | Your News On Time! I was tearing up when seeing many young girls holding hands with their parents or grandparents at the march to fight for their rights, hopes, and dreams against the current establishment and barriers. The story that it shows the world is powerful. Regarding turmeric, researched it and found a whole list of health benefits it brings, great idea to include it in the recipe! Hi just started following you on Instagram..love your posts! I was looking at your sweet potatoe turmeric muffins recipe and was wondering how to alter it since my son has a nut allergy..thanks! Hi Rachel! I’m not quite sure, actually. 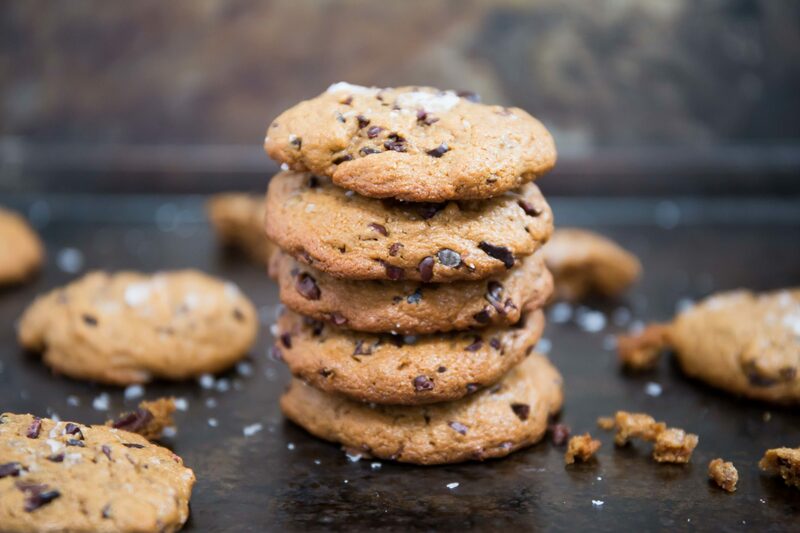 Grain free baking is tricky and the ratios are often really specific. 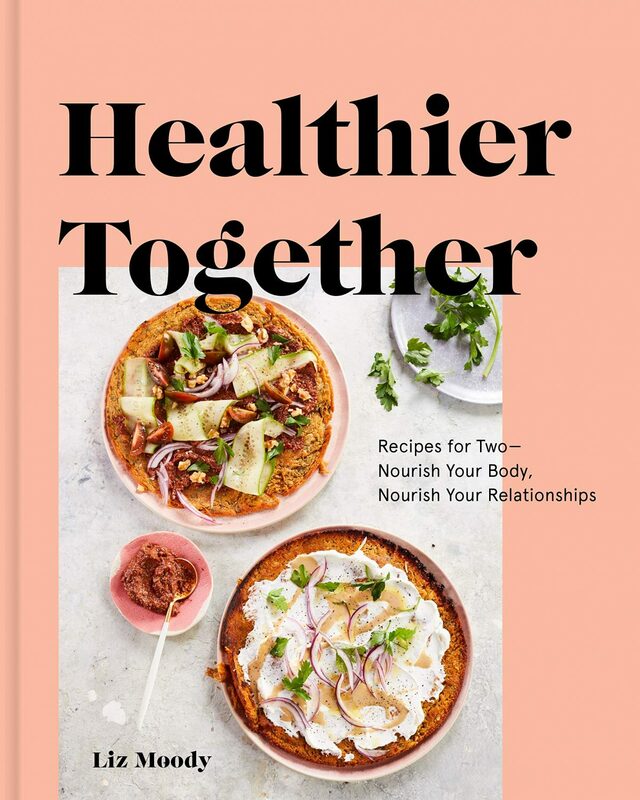 I’m really sorry – hopefully you’ll find other recipes on the site you’re interested in trying! Can he do sunflower seeds or hemp? I have used those previously for school snacks. But yes the swap can be tricky but easier if you find gram based recipes. It might work, but I can never guarantee success of swaps. Try it and let me know!